One third of theatre audiences in London are tourists. A new device which enables theatre goers to read live captions of a performance in eight different languages has launched. AirScript's developers, Cambridge Consultants, hope the handsets will attract more tourists to theatres. The captions, received over wifi, scroll throughout live performances. The handsets have LED backlighting with a black background and orange text to minimise glare. They have a battery life of up to six hours. 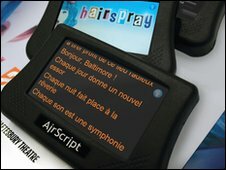 The Shaftesbury Theatre in London is the first to offer the AirScript handsets. Audiences pay £6 to hire the device during a performance of its current production, Hairspray. The script appears in real time in a choice of English, French, German, Italian, Spanish, Russian, Japanese or Chinese. The translations have been made by translators rather than translation software. I found it hard to believe that the AirScript handset would have no glare. But compared with the person sitting next to me, who shamelessly had her smartphone set to full beam throughout the second act, it really is a fairly discreet device. It is probably the first time I have sat through a musical and taken in every single word. Sometimes that in itself became a distraction - I became obsessed with not missing a thing and that made it hard to get lost in the moment at times. I even took advantage of the opportunity to test out my language skills by switching between the different options. Sadly I can't vouch for the authenticity of the oriental texts but I can report that bop beepa babababa bee-ba appears to be a fairly universal European phrase. During the interval I caught up with two tour operators from France and Germany. They agreed that they found the subtitles "quite tiring to look at" but they were enthusiastic about its potential as a tourist attraction. David Bradshaw, group leader of the Software Technology Group at Cambridge Consultant said that the etiquette of the AirScript had been an important factor in its development. "Theatres are not typically welcoming of technology in the auditorium," he told BBC News. "Our biggest challenge was to get a screen into a theatre that wouldn't distract the rest of the audience." The devices contain very little software. The scripts are not stored either - once a line has scrolled off the screen it cannot be retrieved. Up to 200 handsets can run simultaneously in an auditorium. Alex Vegh, chief executive of Show Translations which is marketing the device, said that the idea had only become financially practical in recent years. "Twenty years ago it would have cost £10 million to develop," he told BBC News. "With new technology, it's more affordable." A manual operator ensures that each line hits the screens at the same time as it is delivered on stage. Because each performance is live and subject to pauses or the occasional setback, the process cannot be automated. 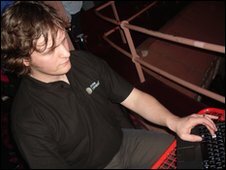 At the Shaftesbury theatre, Ben Young has coordinated the handset scripts throughout the development of the device. Ben Young makes sure the subtitles are delivered on screen in real time. He sits in the corner of the top tier of the theatre. He describes the nightly experience of delivering the same script of Hairspray, perhaps rather generously, as "like two and half hours of playing Guitar Hero". One of his biggest challenges is how to deal with an ad-lib section by Edna Turnblad, a female character traditionally played by a male actor (currently TV and radio presenter Phill Jupitus in this production). "There is a key but you'd have to be a wizard on MSN (chat) to keep up with him," says Mr Young. Fortunately there is an alternative - an "improv" prompt appears as default.